will let me slide just on my cleverness(I do love that word) this time. Jennifer Meyer at Our Creative Corner came up with this sketch and I think I stayed pretty close to it, they're very creative over there check it out. 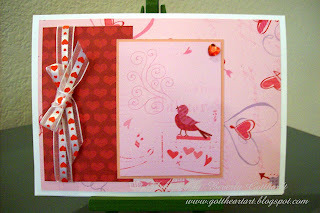 Supplies: Card Blank 5" X 7" Value Card Pack Hobby Lobby, Designer papers-K & Co. Brenda Walton Sweet Talk Paper Pad, ribbon-Wal-Mart, heart trim-Wal Mart, heart crystal sticker.,(no pop dots this time). 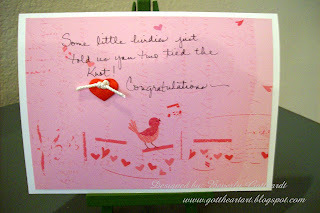 I love your design and the color scheme you chose is PERFECT for that stamp! Great job on this challenge! Thanks for playing along with us at Stamptacular this week! Hope you can join us again soon for some more challenge fun! Great card! I love the way you showed the inside. Sooo cute. Hi Beverely :) Both cards are GORGEOUS!! I LOVE the pink for a wedding card, its FABULOUS!! Such a beautiful wedding card Beverly and gorgeous colour combo. Thank you for playing along with the Creative Card Crew. Great card. Love the colour combo and the little heart with the knot with the sentiment inside.